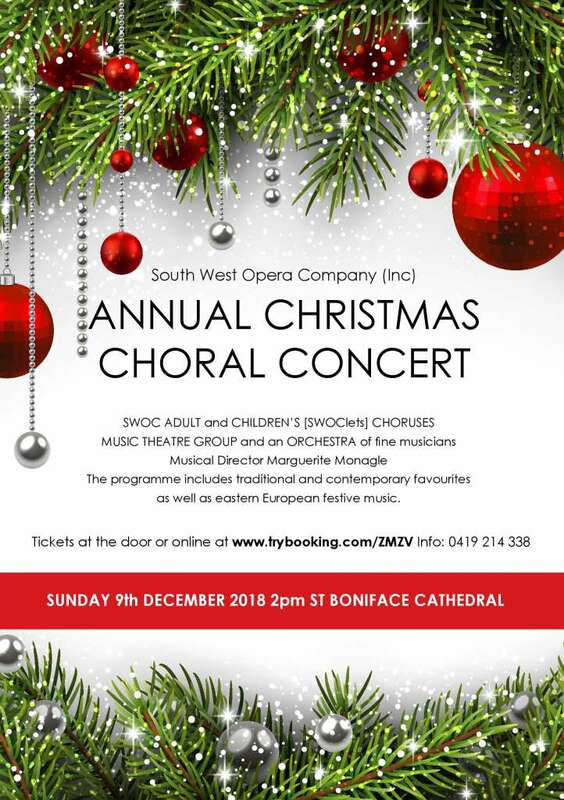 After the phenomenal success of Phantom of the Opera, SWOC continues with its annual repertoire and presents the CHRISTMAS CHORAL CONCERT at the St Boniface Cathedral. St. Boniface, with its outstanding acoustics, is the perfect place to enjoy the soaring voices of the 60 strong adult chorus. The Music Theatre Group and the children’s chorus [SWOClets] will add an extra dimension to the variety of the programme. The Christmas Concert is accompanied by an orchestra of talented musicians from the South West. The programme will include old favourites and new songs finishing with the traditional Hallelujah Chorus. Don’t miss out on this spectacular musical celebration of Christmas.